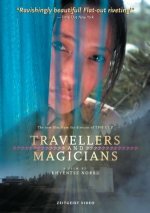 Travellers and Magicians release date was Friday, January 28, 2005. The two men embark on parallel, if separate, journeys. Their yearning is a common one&mdash;for a better and different life. Dondup, delayed by the timeless pace of his village, is forced to hitchhike through the beautiful wild countryside of Bhutan to reach his goal. He shares the road with a monk, an apple seller, a papermaker and his beautiful young daughter, Sonam. Throughout the journey, the perceptive yet mischievous monk relates the story of Tashi. It is a mystical fable of lust, jealousy and murder, that holds up a mirror to the restless Dondup, and his blossoming attraction to the innocent Sonam. The cataclysmic conclusion of the monk's tale leaves Dondup with a dilemma&mdash;is the grass truly greener on the other side?